Our contemporary one-bedroom apartment strikes the perfect balance between the convenience of the inner city and the peace of the suburbs. From here, it's only 10 minutes walk to Sydney University and 15 minutes to the city on public transport. It's also within a short walk to trendy haunts in Glebe, Annandale and Camperdown. The Tramsheds (https://www.tramshedssydney.com.au/) which is part of the same development, houses a supermarket, hair salon, a clinic, gym facilities, liquor shop, and a few top-notch restaurants. Inside, the apartment is an oasis of calmness, with lots of natural light, stylish décor, timber floors, and modern appliances. One of our guests reported that the apt was so quiet that they had the deepest sleep in their life. The place is suitable for sabbatical academics and couples. For your convenience, the advertised price includes all utilities (gas, water, electricity, and internet) and house content insurance. Save yourself from the hassle of connecting utilities. You only need to bring your suitcase, move in and enjoy a wonderful lifestyle close to the CBD and University life. All terms are negotiable by email. * Two parks close by with children's playground, BBQ and much more. My partner is a medical practitioner and I'm an IT specialist. We have our family house in Canberra which is close to ANU and city apt in Sydney which is close to Sydney University. Approaching our retirement, we would like to live in different countries as well and renting our properties out to people on sabbatical leave. We stayed in Changmins and Marks apartment for six months. 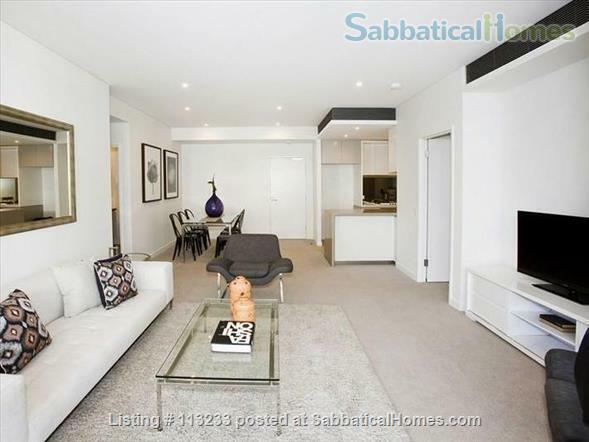 The location is fantastic: close to the Tramsheds and the lively Glebe area with all its coffee shops and restaurants, book stores, yoga classes, jogging tracks along the bay area, music venues and last but not least in walking distance to Sydney University. We lived here without a car. Our daughter went to the local public school. It was all very convenient. We loved our stay there.